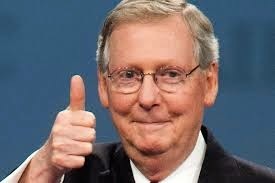 Sen. Mitch McConnell is a negotiating idiot.This is tantamount to us telling Iran we would never use military force to stop them from getting a nuke. Still, McConnell reiterated that there will be no government shutdowns or debt defaults while the GOP is in charge, despite talk among some Republicans of seeking to stop Obama’s immigration action through the appropriations process. “We’d like for the president to recognize the reality that he has the government that he has, not the government that he wishes he had,” McConnell said.